When Oracle(s orcl) got into the hardware business three years ago with its $7.4 billion acquisition of Sun Microsystems, it probably hoped to avoid reports like the one just released by Nomura Securities analyst Rick Sherlund, which paints a bleak picture of the state of its hardware business. Sherlund confirmed what GigaOM has already reported — that revenue on sales of high-end Oracle Exadata, Exalogic, Exa-whatever boxes (otherwise known as “engineered systems”) is not making up for lost revenue from other lower-end boxes, and that customers are defecting to cheaper X86-based machines. 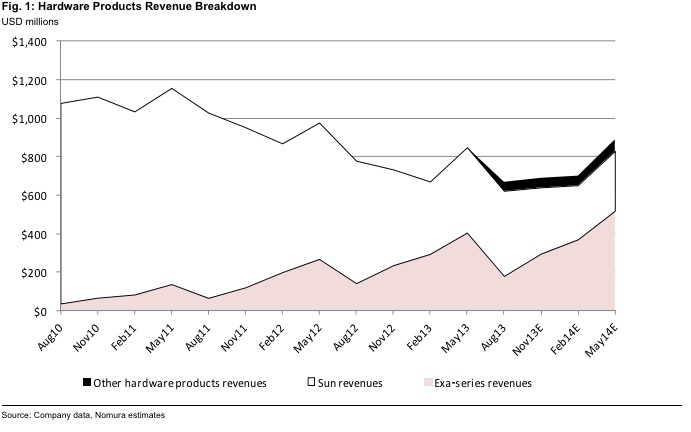 For the first fiscal quarter ending August 31, hardware revenue was off 14 percent compared to the year-ago period. Adding insult to injury, sales of new SPARC-based M Series servers “failed to fuel an upgrade cycle, as customers are moving to the enhanced performance of the lower-priced T Series and T Series customers have moved from Sun to commodity-priced X86-based Linux systems,” according to Sherlund. Update: Oracle declined to comment on this story. I’ve reached out to Oracle for comment and will update this story when that is forthcoming. On the bright side from Oracle’s perspective: the “attach-rate” of software to hardware — meaning the amount of Oracle software that is bundled with hardware purchases — might be a healthy 60 percent, higher even than the 30 percent figure that Oracle co-president Mark Hurd has cited. And, again, Oracle makes a profit on the hardware it does sell. Gross profit margin grew four percent, to 61.9 percent, in Oracle’s most recent quarter, from 53.7 percent in FY 2011. That is a pretty amazing number for hardware. But the question remains: Can the revenue Oracle makes selling a smaller number of high-end boxes make up for revenue lost as customers flee to less pricey options? The answer, thus far, is no. Note: This story was updated at 3:48 p.m. PST with Oracle comment. Hey-Now here is some news to chew on!! IBM’s 3Q14 results are in. Looks much much worse than Oracle. Maybe another article discussing whats newsworthy? IBM’s hardware biz lost more than $713m in first 9 months of this year, compared to $253M profit in same period last year. On a year-to-date basis, IBM had a $1 billion decline in profitability from its hardware business. Ouch! where the past 4 quarters of Power Systems are showing double-digit declines. I don’t believe you fully understand Oracle’s Hardware business as this article has lots of flaws, misguidance and misleading statements. Even Rick Sherlund, who you quote, is a software analyst who, from his statements, doesnâ€™t seem to have much experience in the hardware business-especially the history of Sun/Oracle HW. First, Oracle sells both best of breed x86 and SPARC servers as well as Engineered Systems so the comment that customers are defecting to cheaper X86-based machines just doesnâ€™t make sense as Oracle sells these “cheaper” x86 systems, Oracle also sells & supports RedHat Linux and an improved version called Oracle Linux. There is no evidence provided that competitors are taking share away from Oracle -and if you look at all the Tier 1 x86 vendors including HP, IBM and even Dell, they are all declaring quarterly revenue losses in the double-digits-Not Oracle. If you have access to IDC or Gartner data, who track server shipments, you’ll see that theres actually been growth the last few quarters in Oracle servers, Engineered Systems and especially SPARC and that Oracle has been gaining marketshare from HP and IBM who have both been seeing double-digit declines in their Itanium and Power businesses for last 4+ quarters. Oracle remains #4 in *server* revenues worldwide and grew ~33% on a sequential quarterly basis in last quarter and Oracle holds the number one server vendor spot in the $25K-100K price band and is showing impressive growth in the higher end 100K to 500K price band due to its continued focus on Engineered systems. In the last quarterly announcement, Oracle stated it shipped almost 2,000 Engineered systems in last two quarters. 800 in Q1FY14. And If you look at whats important to a successful business, margin, Oracles is doing great at ~50% margin. Margin translates mainly to R&D which translates to innovations and product advancement. If you look at Oracles R&D budget versus revenue, its 2x greater than IBM’s and almost 3x great than HP, its nearest competitors. I think this article best articulates Oracles new business and how its hardware is driving more revenue for the company. Disclosure: Although I work for Oracle, these comments are all my own and may not represent Oracles. Agreed. Thanks for the note. I kept hearing Ellison and S Catz and Hurd talking on their earnings calls about how great the Engineered Systems pipeline and business was over the last 12-18+ months. But I could not see the market really buying into their scheme. I think more people are believing Intel’s and Red Hat’s and high-volume suppliers view of “Engineered Systems”, as in Engineering them to be cheaper, more powerful, and plug into many places in the computing landscape. Being “engineered” to drive Oracle software sales in a captive manner seems like dragging people back in caves. This is what passes for news? Seriously? All you had to do was ask departed employees. Oracle’s brilliant management of the BU that I used to be part of “grew” that business from $1.2B to $70M in 2.5 years. It takes a lot of Exa to offset that kind of performance. well it does to me since oracle keeps claiming big hardware gains. Just trying to keep ’em honest. thanks for your note.